The sides, who both exited the competition in the group stages, faced each other in a friendly on Thursday at the OFC headquarters at Mt Smart Stadium. Each team posted one win during the tournament – Tahiti triumphing 5-1 over Vanuatu and Tonga upsetting Fiji 2-1 – and were seeking to end their tours on a high note with another victory. Despite the match carrying the ‘friendly’ tag, both sides went into the game in a determined frame of mind and it was clear the result was just as important as those earlier in the week. 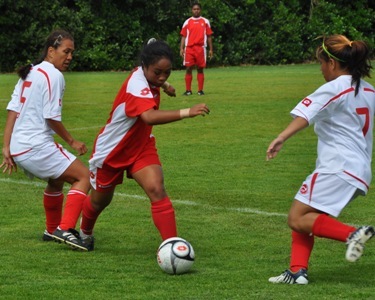 It was Tonga who managed to secure it, notching a come-from-behind 2-1 victory. Captain Penateti Feke was the hero, scoring two second-half penalties for coach Kilifi Uele’s side after Tahiti led 1-0 at the break. The friendly offered both countries the rare chance to meet in an international game – they did not face each other during the tournament proper as they were in different groups.